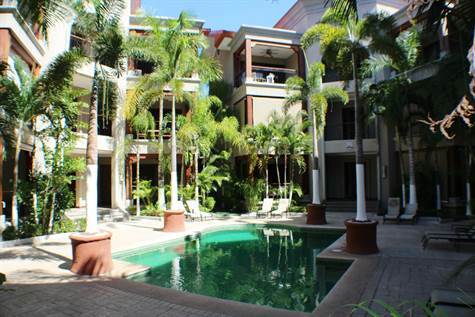 Jacó, Garabito - This is a beautifully appointed luxury Jaco condominium at a fantastic Buyer’s Market price. There are two bedrooms, each with a full en suite bathroom, as well as an additional full third bathroom. Condo is located on Jaco’s beautiful south beach, where the sand is smooth, the scenery incredible. It's quieter and more pristine than Jaco Central but only a short bike ride or 2 dollar taxi to all the action. This condiminium complex was completed in 2006 to luxury specifications; there is no drywall in this unit, construction is steel reinforced concrete block with teak and other tropical hardwood finishes. Kitchen is in immaculate condition with brand new stainless steel Frigidaire fridge as well as a stove, microwave, dishwasher. There is also a laundry room with washer and dryer and laundry sink, all in new condition. North American owners have equipped this unit with high end furniture, including an incredibly comfortable living room sofa with huge pullout bed. All couches are specially custom upholstered for the tropics to withstand humidity. Master bedroom is equipped with a custom built hardwood queen-sized bed frame, mattress, as well as flat screen TV and walk in closet. The master bath has his/hers sinks and a huge shower. There is AC in each room with separate controls for each unit. This unit is on the ground floor for easy access and a spacious outdoor covered patio area that receives cool shade year round. It is in new condition as owners have never rented it out. There is however, excellent rental income potential in this unit new owner would like to earn rental income. There are several property manager companies in Jaco to choose from if needed. The access to the beach is a private gated walkway through a nature trail and stream and access gate opens up right to the sand. This adds extra privacy and serenity to the complex, HOA is a low $350 a month (one of the lowest on the beach) and includes 24 hour security and maintenance on all common areas. This unit comes with a parking space and is being sold fully furnished. Please call or write for more information. This property looks beautiful. A friend referred you at https://topcanadianwriters.com/speedypaper-com-review/. I have been looking for a real estate since a long time.